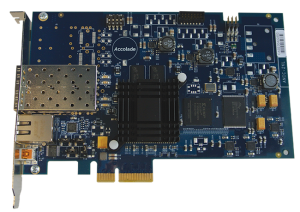 The ANIC-2KL is a low cost, dual port GbE PCI Express Card designed for Host CPU offload in Network Monitoring and Precise Time Stamping applications. The product is based on Accolade’s Advanced Packet Processor (APP) which features a scalable, pipelined architecture implemented in a state-of-the-art FPGA. The APP design allows for seamless integration of packet processing algorithms. Target applications include Packet Capture with Precise Time Stamping and Application Timing using the Precise Time Stamping DoorBell (TSDB) Option. Software Support includes a Comprehensive API and a Linux Driver.